It's the largest state in the USA, and if you cut it in half, the two pieces would be the largest two states! During the last ice age, animals and man could move across unbroken land from Asia right into many parts of what is Alaska today. There was what is commonly called a "land bridge," but since it was 600 miles long and 60 miles wide, bridge just doesn't seem like the right word. Almost magically, Alaska itself was relatively ice free, but at the same time glaciers were so thick to the east of Alaska that passage was impossible to the rest of America. Effectively Alaska was in Asia, and disconnected from America. This is how horses (and camels! ), which were native to America found their way into the Old World, and of course how the collection of odd, often large, and interesting animals made their way over here. What a story! But we will not tell it here. This story is of 2006, and a voyage that four dear friends made together, celebrating their 30th anniversaries, and 28 years of friendship. Come along and enjoy the cruise with us! 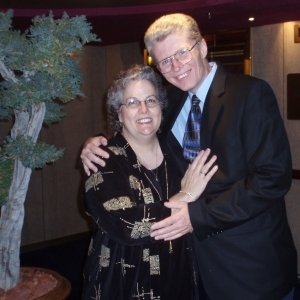 For years Dotti and I had talked about taking a cruise together. I had spent enough time at sea in the US Navy where I was not as excited about the idea as my dear Dotti was, but she has a way of sharing her enthusiasm like no one else I know. I caught the excitement from her, and soon we were making plans. 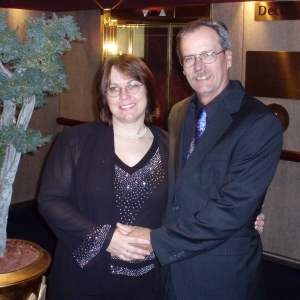 The year 2006 marked the 30th year since Dotti and I got married in a little wedding chapel in downtown Vancouver, Washington. It is absolutely incredible how fast those years have flown by, proving the adage that, "Time flies when you are having fun." It seemed like a good time to take a cruise. Another more or less time related aspect to our decision was the fact that the five-gallon water bottle that Dotti had been saving loose change in for many years (it was too heavy to carry by hand in 2001 when we moved into our current house, and it wasn't then even a third full) was finally reaching the top. I had to open the bottle up with a hacksaw in order to get the money out, because it was way too heavy to pick up and turn over by hand, so we could pour the money out. When the bank counted it up, we found that Dotti had saved over $2,500 in that jar, and it really put a dent in the price of the cruise tickets! And then we had the perfect addition to our plans when our dearest friends Jim and Tammy agreed to join us on the trip! We met in 1978 and our friendship has now covered more than 28 years. Not only that but they were married on New Years Day in 1977. The cruise was in September which put it right in between our 30th anniversary and Jim and Tammy's 30th anniversary. It just seemed right, and it turned out to be more than right; it was absolutely awesome! The event really started on September 15 (Friday night) when Jim and Tammy drove the 6 hours down from Spokane, Washington to our house in Vancouver, right across the Columbia River from Portland, Oregon. After visiting for the evening, we spent the next day shopping and having fun in preparation for the cruise. Sunday we loaded up and headed for the ship in Seattle. In the afternoon we were onboard and the ship pulled away from the pier. It was the next Sunday before the ship pulled back into the pier in Seattle and we left the magical world of the cruise ship behind us. 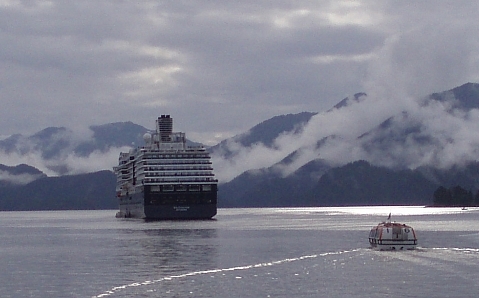 We had seen glaciers, walked the streets of the Alaskan cities of Juneau, Sitka, and Ketchikan (rain and all), and we even had visited Victoria on Vancouver Island in British Columbia, Canada. We had experienced, and to a degree began to acclimate to, a change in climate, as well as to an entirely new living environment. We had been bombarded with change for a week; how we slept, ate, and moved about our world all were very different from what we were accustomed to. We saw so many new things that it was hard to absorb them all. Saturday, Getting Ready: The day before the cruise. All site material ©1998-2007 by DWLZ, INC. (Dotti's Weight Loss Zone.) All rights reserved.